Skilful at fishing, but vulnerable! 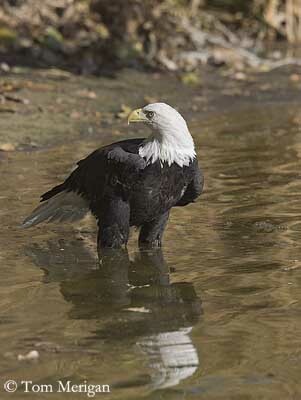 Within the huge Family of the Accipitridae, the group of the fish-eagles includes ten species and two genera, Haliaeetus and Ichthyophaga, closely associated with aquatic habitats. The members of genus Haliaeetus occur on sea coasts and very large inland water bodies, whereas both members of genus Ichthyophaga are often seen along rivers and streams. The Steller’s Sea-eagle (Haliaeetus pelagicus) is one of the largest raptors in the world and the largest fish-eagle with a weight from 5 kg for the male and 9 kg for the female. Their wingspan varies from 220 to 250 centimetres. The smallest species, the Lesser Fishing-eagle (Ichthyophaga humilis) weights 780-785 grams and the wingspan is about 120-123 centimetres. As in other raptors, female is larger than male. They often show brown or grey and white plumage. 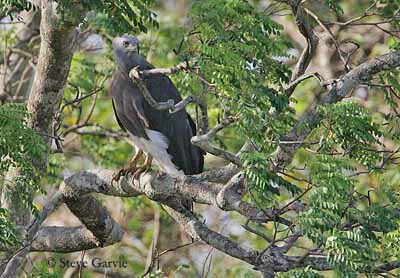 Almost all the fish eagles have paler head and tail, often white or pale grey, contrasting with the dark brown plumage. 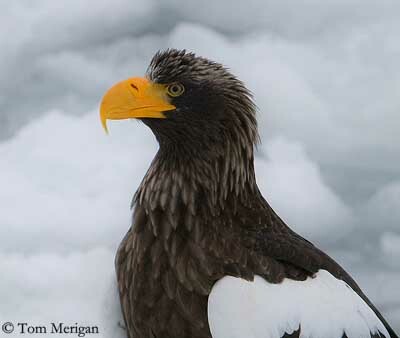 The Steller’s Sea-eagle is the only one with dark brown head, but it shows white shoulders. The Sanford’s Sea-eagle (Haliaeetus sanfordi) and the Lesser Fishing-eagle (Ichthyophaga humilis) have pale or dark brown tail. The fish eagles usually have shorter tail than other Accipitridae species, varying from square to wedge-shaped, adapted to their feeding and hunting behaviour. The feathered legs can be white or dark brown. The huge hooked bill varies in size and colour according to the species. 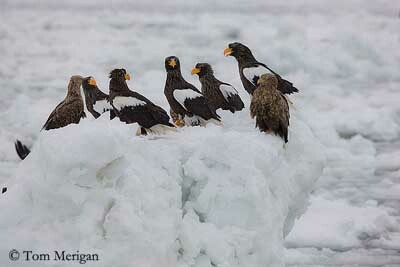 One more time, the Steller’s Sea-eagle has the largest bill, a heavy, rather long structure with broad base. 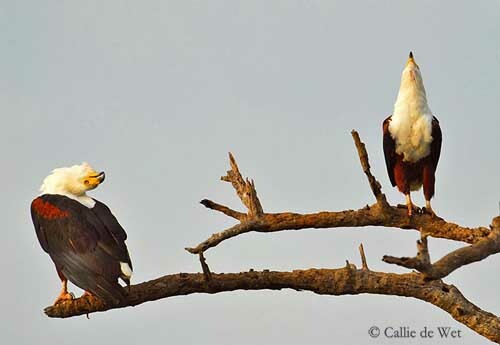 The White-tailed Sea-eagle (Haliaeetus albicilla), the Bald Eagle (Haliaeetus leucocephalus) and the African Fish-eagle (Haliaeetus vocifer) also have relatively large bill, compared with the other species. They have yellow bills, except the latter which as yellow cere and black bill. These four eagles show strong and large yellow feet with sharp talons, allowing them to grasp the slippery fishes while flying. The other species have smaller grey or brownish bills, and smaller greyish to whitish feet with shorter but sharp talons, and less contrasted plumages. 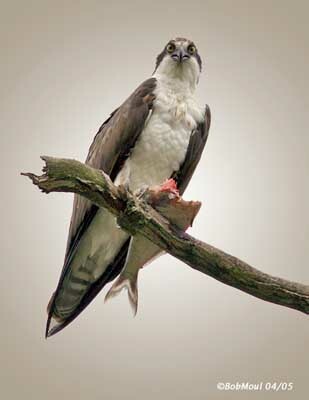 These raptors are highly specialized on fish, and they catch the preys near the water surface. The fish eagles are primarily piscivorous, but they usually take almost dead or vulnerable fish’ species. 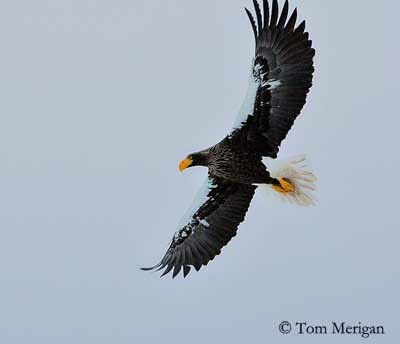 However, the seasonal concentration of Bald Eagles during the autumn on the Chilkat River in Alaska for salmons is something spectacular, as well as the great numbers of Steller’s Sea-eagles and White-tailed Sea-eagles in Hokkaido, Japan, where they collect discarded fish and offal during winter. 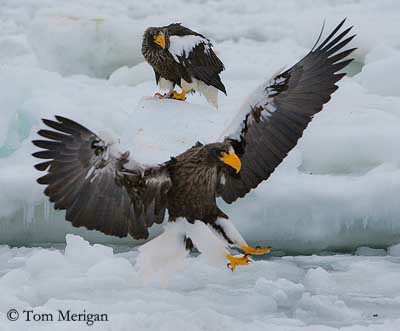 Fish is the largest part of their diet, but these eagles also take carrion, birds, small mammals, amphibians, reptiles and sometimes insects, all in variable quantities and according to the range and the season. They locate the preys more often from a perch than during foraging flights. 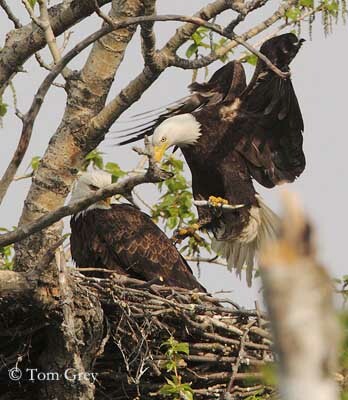 Once the fish is detected, the eagle flies over with the legs held forwards and the talons ready to grasp the victim. Then, it swoops down onto the fish when it is close to the surface. Only feet and legs are immersed. 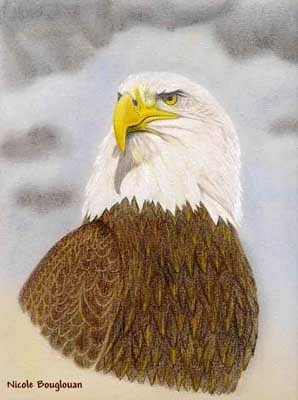 Once the fish is caught, the eagle rises in the air with its prey in the talons. It carries it to a drier place, on land or other perch, a mound of branches above the water or a tree, in order to consume it. 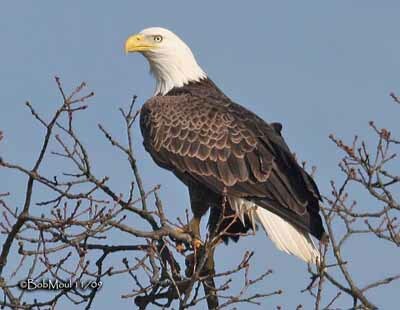 The large eagles are able to catch large fishes, and thanks to the strong bill, they can tear it apart. If the prey is too large, they drag it to the bank. 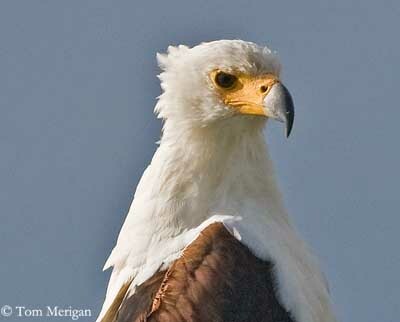 The African Fish-eagle is able to catch fish of 200-1000 grams, but also up to 4000 grams. It hunts mainly from a perch and drags the prey to the shore if too big. It often pursues and pirates other fishing birds. The fish eagles also forage by wading in shallow water where dead or dying fishes are concentrated, or they stand in water or on sandbank from which they catch the prey. They can soar above the water in search of food, and once detected, they fly with the legs held forwards and grasp the fish with the talons. 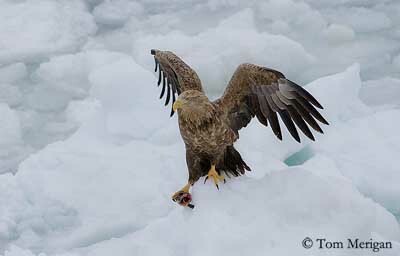 The Steller’s Sea-eagle can also circle 6-7 metres above the water and dive down onto the fish. The fish eagles often steal food from other birds such as the Osprey (Pandion haliaetus) and other birds’ species, birds of prey or cormorants. They take offal from the fishing boats, and enjoy the fish-breeding periods in ponds and pools. They usually hunt alone, but they can be seen in pairs and even in large groups, depending on food availability. At abundant food sources, large flocks can be seen hunting and foraging close to each other. The fish and sea eagles occur along the rivers, on the shores of large lakes, marshes, reservoirs, freshwater wetlands and pools, sea-coasts, estuaries and rocky islands. The two species Ichthyophaga prefer the forested margins of fast-flowing rivers in mountains and are seen around forested lakes for the Lesser Fishing-eagle, and in lowland forest associated with fresh water, large ponds, rivers and marshes and along sea-coats for the Grey-headed Fishing-eagle (Ichthyophaga ichthyaetus). 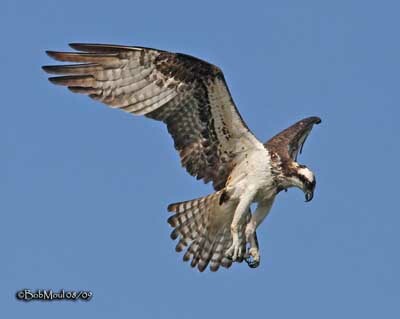 But we cannot talk about the fishing birds of prey without to mention the Osprey (Pandion haliaetus), member of the family Pandionidae. 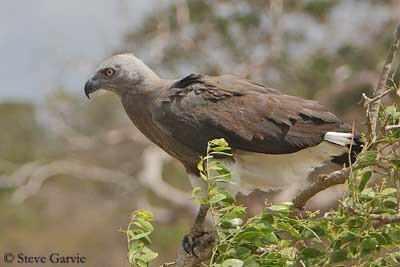 This bird differs from the typical fish eagles by its foraging behaviour. This is only to compare their feeding habits. . 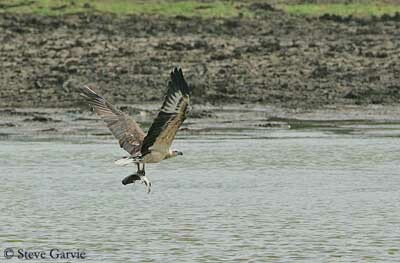 The Osprey flies slowly above the water and hovers in order to detect the preys. It performs dramatic dives from height of 10-40 metres and can penetrate about one metre below the surface of the water. The dive can be spectacular with the wings closed against her body. The bird falls steeply, manoeuvring wings and tail to follow the right track towards the prey. It holds the feet forwards just before the strike. 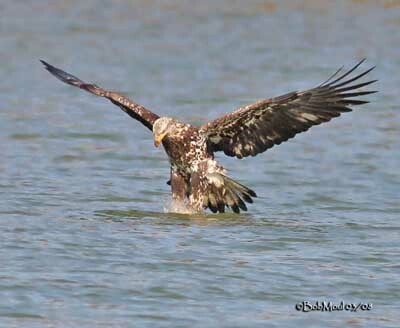 Then, the bird briefly remains on the water to secure the victim, and performs long, fast wing strokes to reach high. Then, when in flight, it holds the prey with one foot behind the other, in order to carry the prey head first to a perch, a branch on a tree, and once the fish is dead, it starts to eat it at the head. 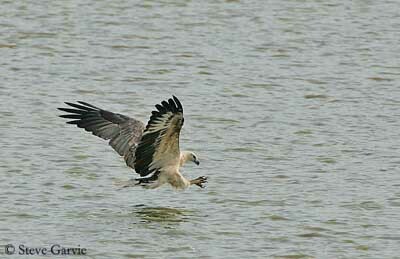 If the Osprey is not threatened, some of the fish eagles are evaluated as vulnerable. However, the White-bellied Sea-eagle (Haliaeetus leucogaster), the Sanford’s Sea-eagle (Haliaeetus sanfordi), the African Fish-eagle (Haliaeetus vocifer), the Bald Eagle (Haliaeetus leucocephalus), the Lesser Fishing-eagle (Ichthyophaga humilis) and the Grey-headed Fishing-eagle (Ichthyophaga ichthyaetus) are not globally threatened. 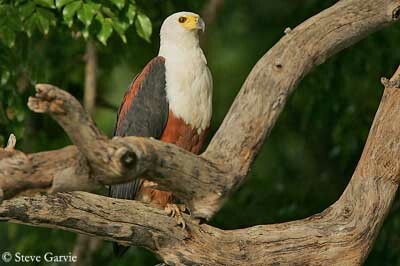 The Madagascar Fish-eagle (Haliaeetus vociferoides) is evaluated as Endangered. The decline is probably due to the degradation of water bodies through deforestation, and persecution of adults and nests. 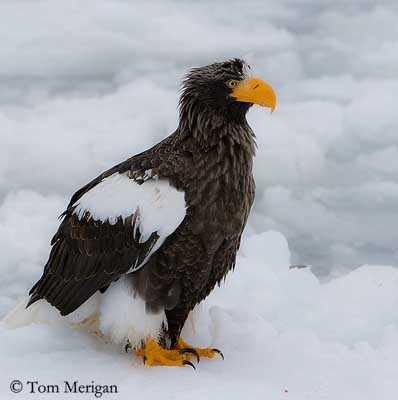 The White-tailed Sea-eagle is evaluated as Vulnerable. The main causes of the decline are direct persecution by poisoned baits and habitat loss. Some reintroduction projects have successfully started but the threats continue to varying degrees. The Steller’s Sea-eagle is rare. The main threats are always habitat degradation, destruction of forests and shooting by hunters. 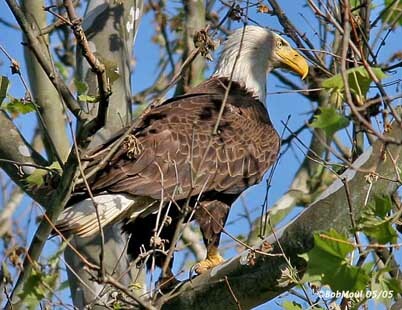 The fish eagles occur throughout the world, except in South America. Most of them are Asian species, except the African Fish-eagle from Africa, the Bald Eagle from North America, and the White-tailed Sea-eagle from Eurasia. 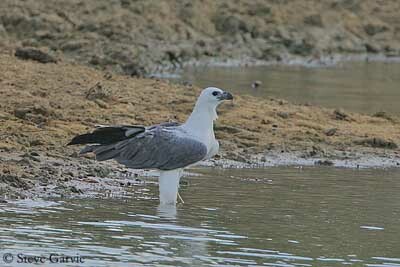 The White-bellied Sea-eagle also occurs in Australia. 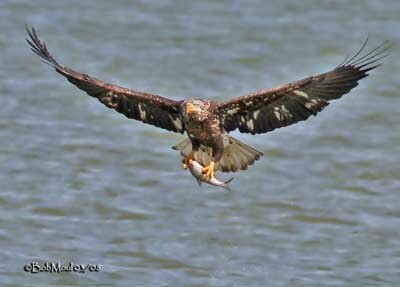 Other birds of prey are fish-hunters, but they behaviour is different. Fish is only a small part of their diet and they often catch them on the shores or in shallow water. 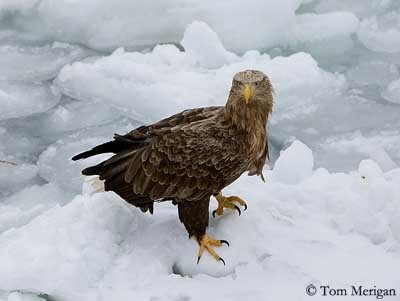 The fish eagles are really fish-eaters, with a large proportion of fish in their diet. Some of them feed almost exclusively on fish. We hope that these beautiful raptors will recover good numbers next day, through the protection of their habitat. 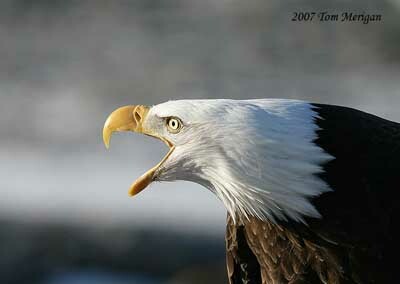 During the breeding season, the fish-eagles perform aerial courtship displays, and are usually quite vocal. 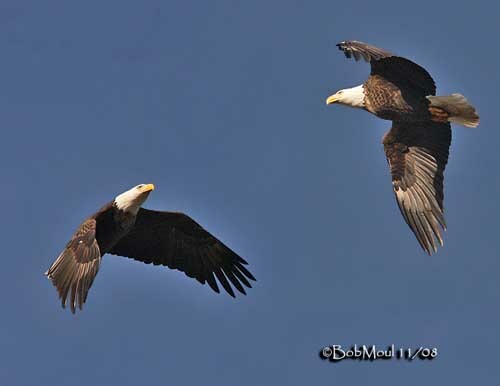 Both mates fly together, courtship feeding by male to female is often observed, and they defend the territory and the nest-site against intruders. The African Fish-eagle utters loud calls when perched or while flying over the territory. The nest is often placed in large tree, or in cliff according to the species and usually close to the water which provides them their food, sea, river or stream. This is a huge construction made with sticks and lined with leaves, also grass or seaweed. The female lays between one and four eggs, but usually only one or two chicks are reared. The incubation lasts from 30-35 to 42-45 days. 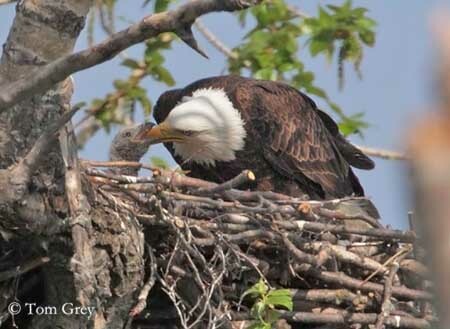 The chicks are fed by both adults and fledge about 70-90 days after hatching.